I’ll be first to admit that I am an overshooter. I take a lot of images of the same thing, just to be sure I get the shot that I first set out to get. I usually start off with a simple perspective, my perspective. Then I’ll move from there to shooting down. Shooting up. Stepping to the side. You name it. It’s important to try different perspectives. I tend to find that I can get two completely different shots of the same subject if I just change my camera angle a little. And I tend to like them both for two different reasons. 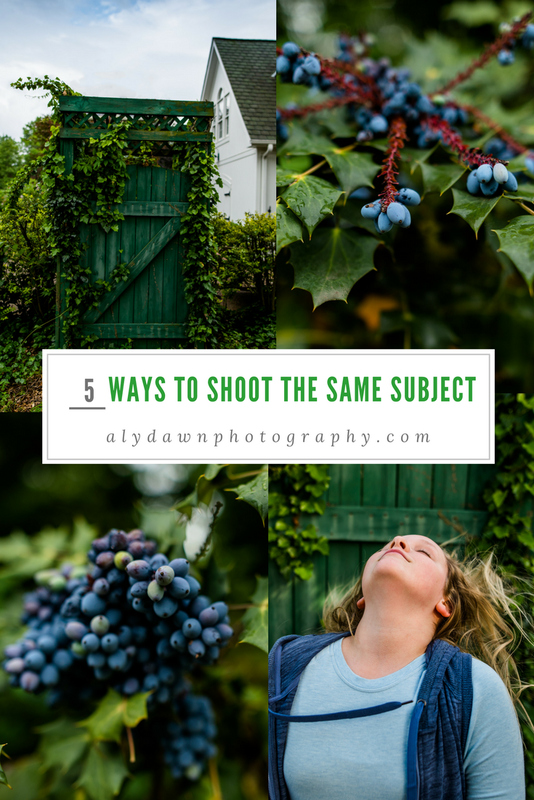 Read on to see why you should take more than one image of the same subject and for a few examples of different perspectives. 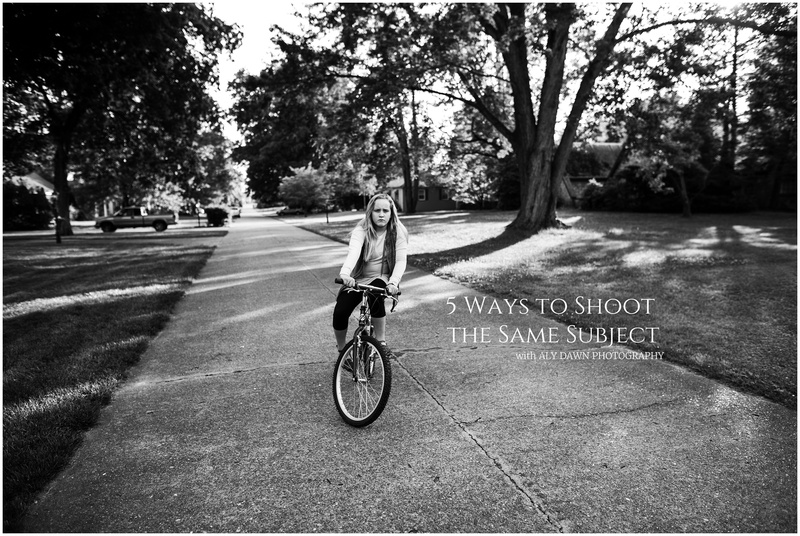 A great way to add variety to your portfolio is shooting the same subject in different ways. There’s many more ways to do this than what is suggested below. Experiment and have fun with it. Include the environment in your shot. Take a wide angle shot. Then get in close and take a picture. This is a great way to get a variety. You can tell I shot in the same place in the images above, but they are two very different images. I love both of them for different reasons. I love how the first one shows the environment. It shows a run down shed. Then the second one completely focuses on the girl in the image, shaking her head. Both are beautiful and both tell a different story. In the next two examples, I show both straight on and shooting up or down. For shooting up, it tends to work better to make an object seem big. This could work for dogs, for children, something that is already small. I don’t shoot up often, especially now since I’m 8 months pregnant, but I do love the variety of shots I can give from shooting up. Shooting up on these blue berries (I am actually not sure what these are!! I wonder if they are poisonous?) shows many more blue berries than shooting straight on. I am obsessed with shooting down on my subjects. Usually because my subjects include dogs, children, and flowers. I think it adds a fun twist to the image. Shooting straight on can be fun as well, but I just love the way images that are shot down look. I love the catchlights I can usually get in my subjects eyes, because light is coming in from above. I also love including my feet in images where I’m shooting down. This can be a fun way to get in the frame. I purposely blur some of my shots sometimes. I think it adds a cool effect to it. Both of the shots above are great and I love both of them for different reasons. But I love the blur one because I think it adds mystery and makes you linger just a little longer. Blurring my shot is especially easy since I use Back Button Focusing, I can just simply twist my focus and take the picture, without having my camera re-focus. It’s a great little effect to use. I tend to still try to make the objects in the frame recognizable, like in the blurred shot above. You can still tell it’s a girl riding a bike. When blurring your shots on purpose, just make sure your intent is clear (for example, don’t have a blurry subject and a crisp clean background, that makes it look like you missed focus). I’ve mentioned shooting from below and above, but shooting straight on can also be an option in adding variety to your portfolio. Shooting straight on can help include the environment and help tell a better story. In the shots above, I love both of them. But the second one with the environment tells a story more than the other. You can tell with the one shot straight on that it’s someone’s yard, the sun is starting to set (based on the light), and there are more flowers than just the one being photographed. I love including straight on images, especially with children or dogs.